Decorative Cabinet Hardware at Low Prices! To place and order: Email us at eeverett4@earthlink.net with the name of your items, count, and shipping address. We will contact you and provide an invoice. Payment can be made with a check, money order or Mastercard/Visa. If you need an estimate or have questions about any of our products, we will be delighted to advise you courteously and patiently. 3474 Red Corral Ranch Rd. You have 30 days to return any item or items in their original unopened package from the date of receipt. You will be credited the full amount minus any shipping charges and a 15% restocking fee. You are responsible for covering the cost of return shipping. If you have any additional questions, please contact us for more information about our return policy. Be sure to visit our booth at Fredericksburg Trade Days in Barn 5, Booth # 19 on Hwy. 290 near Fredericksburg, Texas on the third weekend of every month. 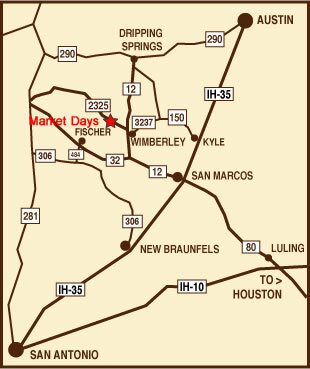 We also have a booth at Wimberley Market Days , Booth # 186 on the first Saturday of the month, March through December. We will not attend The La Bahia Antique Show during the Round Top Antique Fair on March 29 to April 6. 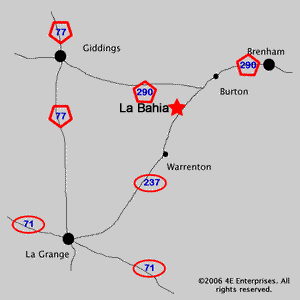 La Bahia is on State Hwy 237 just a 1/2 mile south of 290.